We’ve spent more than 20 years engineering and listening to our customers' feedback so that we could offer equipment that you can count on. Get the job done right with our industry-leading asphalt crack filling equipment. We have our one-of-a-kind crack melter and applicators, pour pots and cleaning machines that work with both hot rubberized crack filler and cold liquid crackfiller to make the job faster and easier. Need advice on the best crack repair machine to get the job done right? Call us for expert advice at 1-866-399-5562 or send us an email. Looking for parts and accessories for your crack filling equipment? We have them in stock and ready to ship! Crack repair is a critical part of asphalt sealcoating and maintenance. 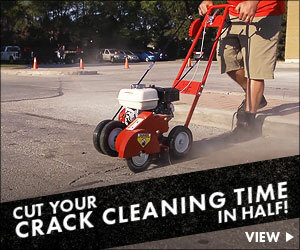 Get the job done right with our asphalt crack filling equipment. We've got pour pots, melters, and cleaning machines that work with both hot melt and cold liquid crackfiller to make the job faster and easier. Not sure what crack filling equipment you need? We can help. Crack Filling Equipment: What Exactly Do You Need? Clean And Prep – You must clean out the damaged area, removing all loose debris and weeds. A screwdriver will suit a single driveway just fine, but for a contractor or property maintenance professional, the ultimate in productivity is a heat lance or a grazor which make this work a snap. If you use a pressure washer, make sure the area is completely dry before doing the crack repair. Applicator – Here the range in tools is huge! From a simple pour pot all the way up to a 2-in-1 melter applicator that will heat, apply, and smooth the hot pour. Sandliner – Rubberized crack filler is far more stable and durable when sand is added. Your crack filling business can get the job done fast and professionally with a Sandliner. No matter who you are, a homeowner or an asphalt professional, there are three tools you must have to do a crack repair. You need to have a way to clean and prep the damaged area, a melter for heating hot pour filler, and an applicator to fill the fracture. Asphalt crack repair equipment for starting your business can be overwhelming. There are so many choices out there. You need to know what machines and tools are the best for your plans, and what will be the most profitable. Let’s take a look at what’s what when it comes to equipment for repairing cracks. Hot Pour Crack Filler is hands down your bread and butter in this business. Any Handy Andy can use cold pour crack filler, and won’t want to pay you to do it for them. The thing with hot pour is you need two things; a way to heat it and a way to apply it. This is why you need asphalt crack repair equipment. Melters are designed to heat up the blocks of hot pour crack filler, and keep it hot, so that it’s ready-to-use in equipment for repairing cracks. Look for a size that suits your needs. You want enough capacity that you can do the job, but not so much that it’s a waste for your business needs. Be sure to get one with an agitator handle so you can keep the pour stirred. Always keep in mind how this will fit in your truck, too. No sense in buying bigger, thinking its better, only to discover you can’t get it to the job site. Applicators come in a wide variety of usefulness. From the simplest of pour pots to wheeled equipment for repairing cracks, it’s all a matter of what’s best for your needs. Pour pots are fairly inexpensive and easy to use, but not as quick as using a wheeled applicator. If you’re looking at working quickly, make sure the applicator has got a scraper to smooth as you go. 2-In-1 Asphalt Crack Repair Equipment is the best of both worlds. It will heat the hot pour crack filler and act as the applicator as well. What makes this truly useful is the product stays hot while you work. Now before you go crossing melter off your list, remember, you may still want a melter to have hot pour ready to go at all times with no waiting. If you plan on handling parking lots, or doing multiple driveways a day it will save you a lot of time. Other Equipment For Repairing Cracks: There is more to consider adding to your list of asphalt crack repair equipment. You have a way to heat and apply the hot pour crack filler, but, what about cleaning the cracks in the first place? For success you need to get down in there and remove debris and weeds, and sure enough, there’s a machine you can buy to do that for you. It all depends on how much you want to save on time, versus spending money on tools. Equipment for repairing cracks is absolutely a must if you intend on using hot pour crack filler in your business. Really, that’s where the money is in this business. The Handy Andy crowd are fully capable of using the cold pour themselves. Decide on what makes the most sense for your business to melt and apply the crack filler. Consider what a crack cleaning machine can do to save you time, and whether it’s worth it to you. Now you know exactly what asphalt crack repair equipment you need to start your own business.